I’ve cracked more than my fair share of fresh coconuts, and tried a number of ways to open them, including doing as the monkeys do and lifting them high above my head and crashing them to the ground. Which I don’t recommend, unless you aren’t wearing pants (like monkeys do) because your pants will get all wet. (Like mine did.) In baking, I tend to use dried coconut (also called desiccated coconut) for cookies and infusing in custards and so forth, as it tends to have a more concentrated flavor than the fresh and less moisture, which can alter a recipe. 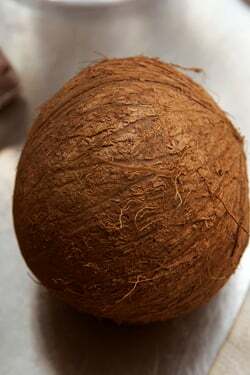 I primarily use fresh coconut meat (the kind extracted here) for garnishing, ice creams, sorbets, and even cocktails. There are a number of devices, including wooden boards with jagged teeth and rotary devices that might be worth it if you are doing a lot of coconut. But since I only crack one coconut open every few months or so, I don’t know if I want to give valuable cabinet space to something I would only use occasionally. You can usually find fresh coconuts in stores that cater to Indian, Mexican, and Asian cooks, as well as well-stocked supermarkets. 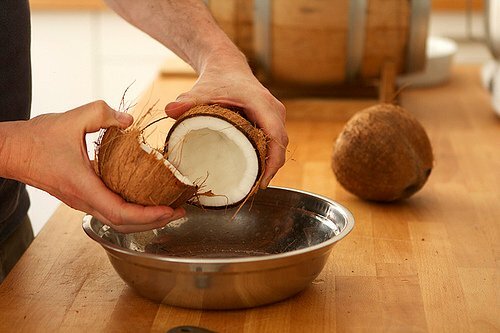 When buying a coconut, lift the coconut and give it a good shake; there should be plenty of liquid sloshing around inside. (Note that the liquid isn’t coconut milk, as some believe; it’s coconut water. 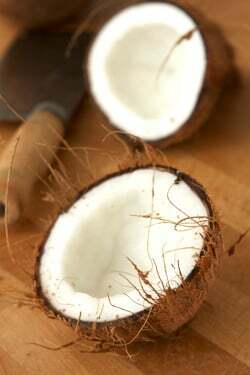 Coconut milk is made by blending water with the meat.) Also make sure there is no mold on the outside, where the eyes are. Some folks like the remove the fibers from the outside of the coconut before cracking it, which you may wish to do over a sink as it’s somewhat messy. 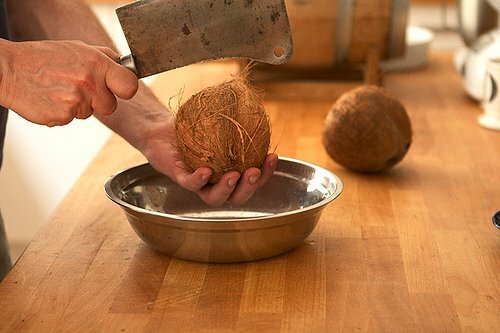 If you don’t want to use a cleaver, wrap the coconut in a towel – one you don’t mind getting wet – and use a hammer to break it open. 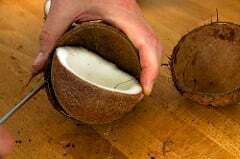 Put the coconut halves on a shelf in a preheated 400ºF (200ºC) for 20 minutes, which will help separated the meat from the shell. 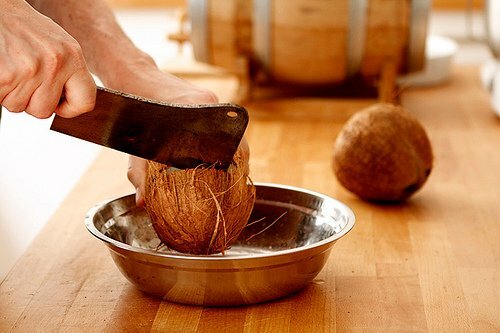 When the coconut halves are cool, use a flat-head screwdriver wedged in between the meat and shell to pry them apart. 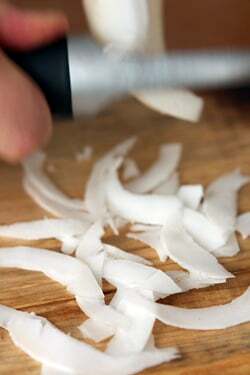 Take a vegetable peeler and remove the skin of the meat, then grate or grind the coconut meat, as you wish. 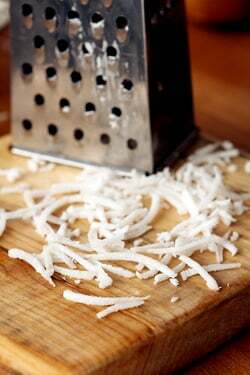 For decoration, you can take a vegetable peeler and make thin strips, or grate the coconut with a metal grater into shreds. 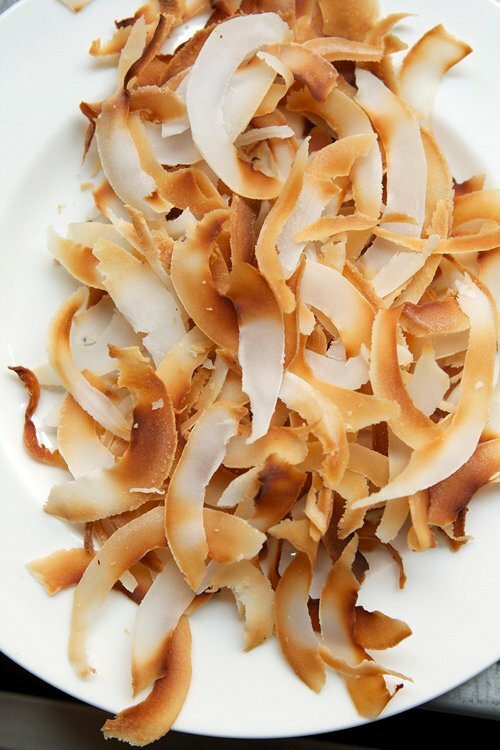 To toast the coconut, spread the shredded coconut on an unlined baking sheet and bake in a preheated 350ºF (180ºC) oven for 12 – 18 minutes, stirring a few times while it’s cooking, so it toasts evenly. Thinner strips will toast more quickly than thicker ones. The way I am familiar with, coconut milk is made by blending water, not coconut water, with the meat and then straining it. Coconut water from mature coconuts is thrown away. It seems there are different methods. Not sure why one would you throw away the coconut water from mature coconuts, and use tap water. Is there a reason for that? we figured out by crazy trial and error how to get into coconuts, but to get it out-we were still using crazy, hacking methodologies so thanks for this! Would you happen to know roughly how much coconut by weight is in a single shell roughly, or perhaps it varies greatly? 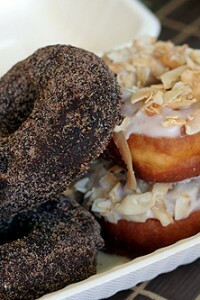 The first step is coconut cream, where the process is the same as coconut milk. Water+mature coconut. But not a lot of water and then extracted using a muslin cloth. 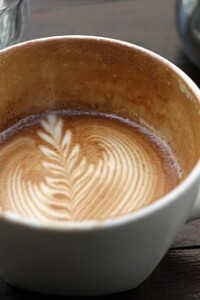 So in a way the first pressed,dense product is cream. 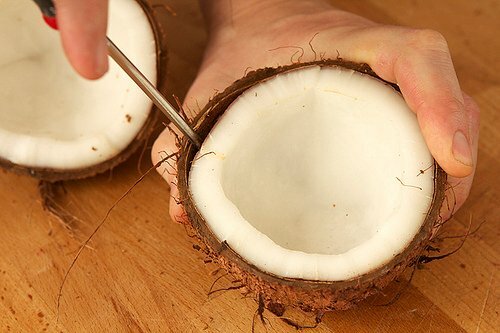 Add water to the same coconut and that gives you milk. Now we don’t throw away anything, so we always drink water from the mature coconut. Sometimes, when your not lucky you get a rancid type of coconut and there even the water will taste funny. But so will the flesh. So there you may throw the water away. The top of that coconut flesh can be cut off and if the smell hasn’t permeated the bottom layers, that coconut is also good to use. Kinda like cheese and fungus :) As to why use tap water instead of that water..perhaps cos the flavour of coconut water will change the flavour of the milk ? I need to ask the mother-in-law. My in-laws are from Kerala and we have a HUGE room outside the main building , just for coconuts. And usually an old,lean guy comes to manually ( its a cool looking apparatus ) take off the top of young coconuts and reveal the brown one inside which is then stored and used to months!! I clicked pictures of him,just cos I was so fascinated. I have the first wooden board for scraping. Its quite fun but we have to sit on the wood to scrape. Very primitive and fun!! Thanks for always making this blog a space that covers the entire planet! Jyoti: Thanks! Would be interesting to know the answer on why folks don’t use the coconut water. Seems a shame to throw it away. I did edit the post to reflect that people use water rather than coconut water. When I was a kid growing up in Texas we used to get lots of coconuts. Before breaking them open we would pierce at least two of those three “eyes” that are at one end with an ice-pick and drain out the coconut water. That way there’s no chance of losing what, to me, was the best part of the coconut when cracking it open. But who has ice-picks in this day and age? You could also use a nail and hammer it in, I guess. Some people use electric drills but drill bits get kind of icky and not sure I, or others, want to drink liquid that passed through a drilled hole. I passed on fresh coconut last week at the asian market, because I thought it would just lie there on the counter. But now it sounds tempting! Dried coconut here has a strong soapy smell when baking, very discouraging, but it tastes just fine. Weird. 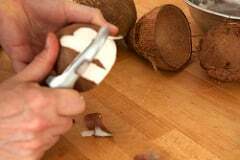 By far the best tutorial, both textually and visually, on opening a coconut then preparing the meat that I have ever read. Thank you for this! I checked with the MIL..She says its always done with water and so thats how they do it. But we brainstormed and came to the conclusion that adding coconut water will probably ferment the mixture. She will ask the village elders now but she is quite convinced that it’ll ferment! Drink the water..don’t throw it away..
Also, if you ever get a chance, try eating the inside flesh of a tender coconut..In Bombay,where I come from, we use the top of that tender coconut as a spoon to scoop this flesh and eat it right at the roadside! Bliss! Thanks. That’s interesting because coconut water is generally sterile, until you open the coconut. So not sure how it would cause the coconut milk to ferment any faster than water. Likely is that people just tossed the water since a big majority of the flavor is where the coconut meat is. Don’t discard the coconut water. In Malaysia where I live, we drink the coconut water. It’s very cooling and a savior for hot days! A note for the unwary: coconut milk (or water) stains terribly, as my husband found out with his favorite T shirt. Sometimes you don’t see the stain until after the item is washed. Always wear an old shirt, or apron that covers any fabric you care about! I observed that the coconut water does sour quite quickly, even if kept in the refrigerator. I think it stays sweet only about one day so I’d advise to drink it as soon after opening as you can. I don’t think it goes “bad” when it’s turned sour, sort of like raw milk doesn’t go “bad”, it just changes form due to the flora present, but coconut water doesn’t taste very good once fermentation has begun. I am guessing it is because coconut water from mature coconut does not taste particularly pleasant. Even if it did taste pleasant like coconut water from young coconut, adding it to desiccated coconut would affect the taste. Makes me think of the process of making vege stock where veges are chucked away because all the flavour/nutrients has gone into the water. Maybe this applies to coconuts as well? I have made coco cream many times. Coco water spoils within a day or two, even refrigerated, and that’s why it’s not used to make cream. But it is delicious made that way so is great if you’re using it that day. FYI, the cream also makes a killer dairy-free whipped cream! Basically the water is an electrolyte-rich treat to reward yourself with after the work of opening the nut. I prefer young water but mature water is good too, just a bit nuttier tasting. It should never taste “off”. If you’ve got a good slow-style juicer, you can run the meat through to get an excellent rich cream without adding any liquid. Then dehydrate the pulp and use that too. I blend mine in a high speed blender (vitamix) with enough water to barely cover and strain through a nylon nut milk bag. A muslin cloth works too. Freeze in flat, sandwich sized ziplocks or ice cube trays for up to 6 months. I still vividly remember my first taste of the classic southern style coconut layer cake made with finely shredded fresh, moist coconut and whipped cream. An angelic neighbor made it one year and it made a deep impression on me as an American child of the suburbs in the 70’s. Had the privilege of visiting Hawaii for the first time last year and one of my favorite things was the ice cold coconuts on the road side that one could buy and they would pop a straw into it and you would drink up all the yummy water inside. I would then take it to our little cabin and pry out all the fresh coconut to eat- very yummy!! David, I was told in India that coconut water contains elements that might cause the mixture to ferment faster. It’s an issue in India’s warm climate. But it’s never thrown away, as others pointed out. You can use it to marinate meat or chicken. I cook with fresh coconuts often, so usually, I strain and freeze it until I have enough. Pork chops marinated in coconut water, lemongrass (or lemon zest), some sugar, fish sauce and garlic are delectable and very tender. Great post. Coconuts are wily little suckers, but not insurmountable. I’ve tried several methods of opening coconuts, but this is the best (I figured this out after stabbing myself with an ice pick a couple times). I love coconuts. We are going to stay on a island where we can eat as many coconuts as we want for free. They are green coconuts though and we won’t have cleavers and hammers so we cannot apply your methods. But I have been informed there is a ‘coconut opening station’. Coconut water has a pronounced laxative effect…. so tread easy! @David: The mature coconut water is usually thrown away because the taste has gone off by then; no longer sweet and delicious. I just ate fresh coconut – an entire half of one – on its own recently and was obsessed. I need a better knife. I usually pierce one of the eyes with a corkscrew and then drain the water into a glass (which I greedily drink). Then one of the children usually goes outside and has fun dropping it on the floor. Amazing how it can bounce but it does eventually crack. Never put it in the oven – I just lever bits out with a knife usually. It’s all so easy and not any effort whatsoever. That was so helpful. I never knew to heat up the coconut halves in the oven. I always struggled to get the meat out, picking at it until my hands ached. Thanks for that great tip. I may just buy one this weekend. It’s been years since I had fresh coconut. I’ve just followed the instructions above and they work perfectly! Many thanks. I’m not going to toast the flesh, but freeze the shreds. It looks like it will freeze well, but it is a bit of an experiment. The water I am planning to add to some home made cherry syrup to make a drink for a birthday party tomorrow — also an experiment. Now I have the urge to go to Chinatown to get a whole coconut. In Tahiti, we use everything but the shell. We crack the coconut, and then drink the water right away. To make coconut milk, we don’t (never) add coconut water. We just grate the coconut meat and squeeze it in a white cloth.